The inflorescences are in the shape of a fan and contain one or more symmetrical six-lobed flowers. These grow on a pedicel or peduncle. The three sepals, which are usually spreading or droop downwards, are referred to as "falls". They expand from their narrow base (the "claw" or "haft" ), into a broader expanded portion ("limb" or "blade") and can be adorned with veining, lines or dots. 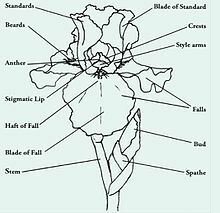 In the centre of the blade, some of the rhizomatous irises have a "beard" (a tuft of short upright extensions growing in its midline), which are the plants filaments. 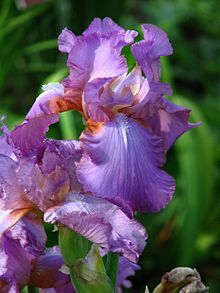 Bombay Sapphire gin contains flavoring derived from particular bearded iris species Iris germanica and Iris pallida. 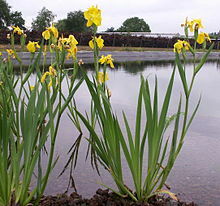 In water purification, yellow iris (I. pseudacorus) is often used. The roots are usually planted in a substrate (e.g. lava-stone) in a reedbed-setup. The roots then improve water quality by consuming nutrient pollutants, such as from agricultural runoff. This highly aggressive grower is now considered a noxious weed and banned in some states of the US where it is found clogging natural waterways. The Iris is one of the flowers listed as birth flower for February. In Christianity, the iris represents Our Lady of Sorrows as its sharp leaves are like swords. The Iris croatica is the unoffical National Flower of Croatia . Iris nigricans, the Black Iris is the national flower of Jordan. Iris bismarckiana, the Nazareth Iris, is the symbol of the city of Upper Nazareth. In 1998, Iris lacustris, the Dwarf Lake Iris was designated the state wildflower of Michigan, where the vast majority of populations exist. In 1990, the Louisiana iris was voted the state wildflower of Louisiana, though the state flower is the magnolia blossom. An iris — species unspecified — is one of the state flowers of Tennessee. It is generally accepted that the species Iris versicolor, the Purple Iris is the state flower alongside the wild-growing purple passionflower (Passiflora incarnata), the state's other floral emblem. Greeneville, Tennessee, is home to the annual Iris Festival celebrating the iris, local customs, and culture. The species Iris versicolor is also the provincial flower of Quebec, having replaced the Madonna lily which is not native to the province. and it is the official flower of Kappa Pi International Honorary Art Fraternity. French King Clovis I (466–511), when he converted to Christianity, changed his symbol on his banner from three toads to irises (the Virgin's flower). The fleur-de-lis, a stylized iris, first occurs in its modern use as the emblem of the House of Capet. The fleur-de-lis has been associated with France since Louis VII adopted it as a symbol in the 12th century. The yellow fleur-de-lis reflects the yellow iris (I. pseudacorus), common in Western Europe. Contemporary uses can be seen in the Quebec flag and the logo of the New Orleans Saints professional football team and on the flag of Saint Louis, Missouri. The red fleur-de-lis in the coat-of-arms of Florence, Italy, descends from the white iris, which is native to Florence and which grew even in its city walls. This white iris, displayed against a red background, became the symbol of Florence until the Medici family, to signal a change in political power, reversed the colors, making the white one red and setting in motion a centuries-long breeding program to hybridize a red iris. The fleur-de-lis is the almost-universal symbol of Scouting and one of the symbols adopted by the sorority Kappa Kappa Gamma. A stylized yellow iris is the symbol of Brussels, since historically the important Saint Gaugericus Island was carpeted in them. The iris symbol is now the sole feature on the flag of the Brussels-Capital Region. The provincial flower of Québec (Canada) is the harlequin blueflag (I. versicolor), called iris versicolore in French. It is thought in China, that Iris anguifuga has the ability to keep snakes from entering the garden. It grows all winter, keeping snakes out, but then goes dormant in the spring, allowing the snakes back into the garden. In the autumn, the iris re-appears and can stop the snakes again. In the Homeric Hymn to Demeter, the goddess Persephone and her companion nymphs (the Oceanids along with Artemis and Athena) were gathering flowers such as rose, crocus, violet, iris (also called 'agallis' or ἀγαλλίς (in Greek script), lily, larkspur, and hyacinth in a springtime meadow before she was abducted by the god Hades. It has been suggested that the 'agallis' mentioned was a dwarf iris, as described by leaf and root shape,) and identified as Iris attica. ^ "WCSP: Iris". World Checklist of Selected Plant Families. Retrieved 2 June 2014. ^ "Iris". Pacific Bulb Society. 2011-11-26. Retrieved 2012-03-03. ^ Manning, John; Goldblatt, Peter (2008). The Iris Family: Natural History & Classification. Portland, Oregon: Timber Press. pp. 200–204. ISBN 978-0-88192-897-6. ^ R. A. Fisher (1936). "The use of multiple measurements in taxonomic problems" (PDF). Annals of Eugenics. 7 (2): 179–188. doi:10.1111/j.1469-1809.1936.tb02137.x. hdl:2440/15227. ^ "Parts of an Iris Flower". merlebleu. Archived from the original on 2016-03-04. Retrieved 28 August 2015. ^ "The Beauty and Function of the Iris Flower". wordpress.com. 2011-04-03. Retrieved 28 August 2015. ^ a b c d Rina Kamenetsky; Hiroshi Okubo, eds. (2012). "Iridaceae". Ornamental Geophytes: From Basic Science to Sustainable Production. CRC Press. p. 24. ISBN 978-1-4398-4924-8. ^ Austin, Claire (2005). Irises; A Garden Encyclopedia. Timber Press. p. 124. ISBN 978-0881927306. ^ "RHS Plant Selector – Iris 'Alizes'". Royal Horticultural Society. Retrieved 20 May 2013. ^ "RHS Plant Selector – Iris 'Bumblebee Deelite'". Royal Horticultural Society. Retrieved 20 May 2013. ^ "RHS Plant Selector – Iris 'Early Light'". Royal Horticultural Society. Retrieved 20 May 2013. ^ "RHS Plant Selector – Iris 'Jane Phillips'". Royal Horticultural Society. Retrieved 20 May 2013. ^ "RHS Plant Selector – Iris 'Langport Wren'". Royal Horticultural Society. Retrieved 20 May 2013. ^ "RHS Plant Selector – Iris 'Maui Moonlight'". Royal Horticultural Society. Retrieved 20 May 2013. ^ "RHS Plant Selector – Iris 'Orinoco Flow'". Royal Horticultural Society. Retrieved 20 May 2013. ^ "RHS Plant Selector – Iris 'Raspberry Blush'". Royal Horticultural Society. Retrieved 20 May 2013. ^ "RHS Plant Selector – Iris 'Sarah Taylor'". Royal Horticultural Society. Retrieved 20 May 2013. ^ "RHS Plant Selector – Iris 'Thornbird'". Royal Horticultural Society. Retrieved 20 May 2013. ^ "RHS Plant Selector – Iris 'Titan's Glory'". Royal Horticultural Society. Retrieved 20 May 2013. ^ Wilson, Carol A.; Padiernos, Justin; Sapir, Yuval (February 2016). "The royal irises (Iris subg. Iris sect. Oncocyclus): Plastid and low-copy nuclear data contribute to an understanding of their phylogenetic relationships". Taxon. 65 (1): 35–46. doi:10.12705/651.3. Retrieved 4 January 2018. ^ "Magellan Gin". theginisin.com. 2011-01-29. Retrieved 29 May 2018. ^ "Birth Month Flower of February - The Iris". 1st in Flowers!. ^ "Wildlife and Vegetation". kinghussein.gov.jo. Government of Jordan. Retrieved 2015-05-10. ^ Rinat, Zafrir (11 September 2006). "Caution, Iris Ahead!". haaretz.com. Retrieved 25 July 2016. ^ "Iris lacustris Nutt". michiganflora.net. Retrieved 9 April 2015. ^ "Michigan State Wildflower". Netstate.com. Retrieved 2012-05-14. ^ "Michigan Natural Features Inventory" (PDF). Archived from the original (PDF) on 2011-09-29. Retrieved 2012-05-14. ^ Charlotte Seidenberg (1 March 1993). The New Orleans Garden: Gardening in the Gulf South. Univ. Press of Mississippi. p. 223. ISBN 978-0-87805-637-8. ^ "Louisiana State Wildflower". statesymbolsusa.org. Retrieved 28 November 2014. ^ "Chapter I Rhizomatous Iris (part 2)". irisbotanique.over-blog.com. Retrieved 20 October 2015. ^ Singh, Gurcharan. "Kashmir Iris". flowersofindia.net. Retrieved 22 October 2015. ^ Stebbings, Geoff (1997). The Gardener's Guide to Growing Irises. Newton Abbot: David and Charles. p. 23. ISBN 978-0715305393. ^ Austin, Claire (2005). Irises; A Garden Encyclopedia. Timber Press. ISBN 978-0881927306. ^ Trak, Touseef Hussain; Upadhayay, Ravi (April 2015). "Ethnobotanical And Taxonomic Study Of Members of Iridaceae Family of Kishtwar, (Jammu And Kashmir) India" (PDF). International Journal of Pharma and Bio Sciences. 6 (2): 779–793. Archived from the original (PDF) on 2016-08-02. Retrieved 22 October 2015. ^ "State of Tennessee". state.tn.us. ^ "18th Annual Iris Festival". Greenecountypartnership.com. Retrieved 2012-03-03. ^ "Species and Water Garden Iris". iriscitygardens.com. Retrieved 19 January 2015. ^ Kramb, D. (14 September 2004). "Iris anguifuga". 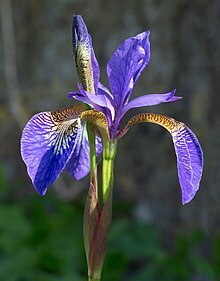 signa.org (Species Iris Group of North America). Retrieved 19 January 2015. ^ "ἀγαλλίς". lsj.translatum.gr. Retrieved 10 September 2015. ^ a b "Flora 1, Plants of Greek Myth". theoi.com. Retrieved 9 September 2015. ^ "Tag Archives: British Iris Society". wiebkerost.com. Retrieved 10 September 2015. Rina Kamenetsky; Hiroshi Okubo, eds. (2012). "Iridaceae". Ornamental Geophytes: From Basic Science to Sustainable Production. CRC Press. p. 24. ISBN 978-1-4398-4924-8.